I find out that the 12 days of Christmas were not the catechism in code taught to Roman Catholics in England during the time they were not permitted to practice their faith openly. * The partridge in a pear tree was Jesus Christ. * Three French hens stood for faith, hope and love. * The four calling birds were the four gospels of Matthew, Mark, Luke & John. * The five golden rings recalled the Torah or Law, the first five books of the Old Testament. * The six geese a-laying stood for the six days of creation. * Seven swans a-swimming represented the sevenfold gifts of the Holy Spirit - Prophesy, Serving, Teaching, Exhortation, Contribution, Leadership, and Mercy. * The eight maids a-milking were the eight beatitudes. * Nine ladies dancing were the nine fruits of the Holy Spirit-Love, Joy, Peace, Patience, Kindness, Goodness, Faithfulness, Gentleness, and Self Control. * The ten lords a-leaping were the ten commandments. * The eleven pipers piping stood for the eleven faithful disciples. * The twelve drummers drumming symbolized the twelve points of belief in the Apostles' Creed. 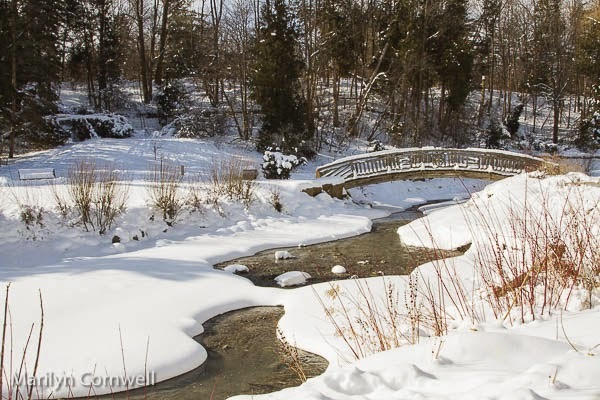 Our selected image today comes from the Toronto Botanical Gardens, Wilket Creek in winter 2014.